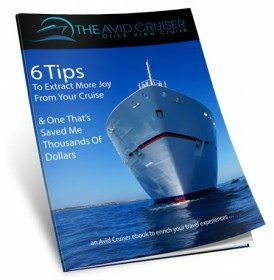 A lot of cruise passengers depart the dock in Kusadasi, visit the ancient historic site of Ephesus, and think they’re done. Having padded the fabled Marble Road (which connects the Celsus Library and the Great Theater in Ephesus), they check Kusadasi off their lists. Been there, done that. I confess to being among that group. 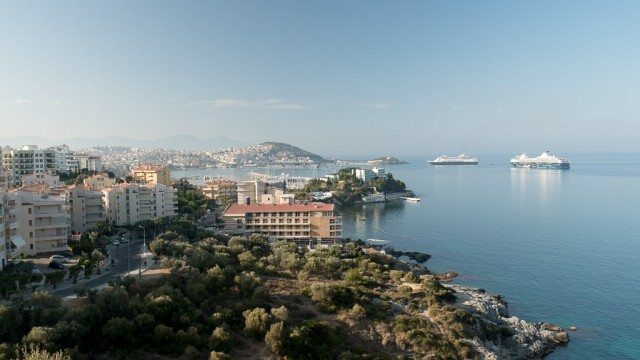 I characterized Kusadasi as offering only two things: 1) the town itself, a seaside resort, and 2) the ancient Greek, later Roman, city of Ephesus, about 30 minutes away from Kusadasi’s waterfront. It wasn’t until my third visit that I discovered that Kusadasi offered much more than Ephesus. In fact, the region’s best-known historic site is only one of many historic sites worthy of a visit. 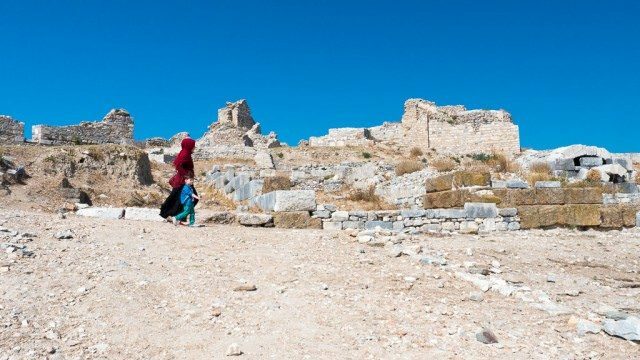 Kusadasi also serves up religious shrines, authentic villages where you can enjoy lunch in a family home, once-thriving maritime cities, the remains of massive Greek temples )including one that ranks among the Seven Wonders of the Ancient World) and much more. 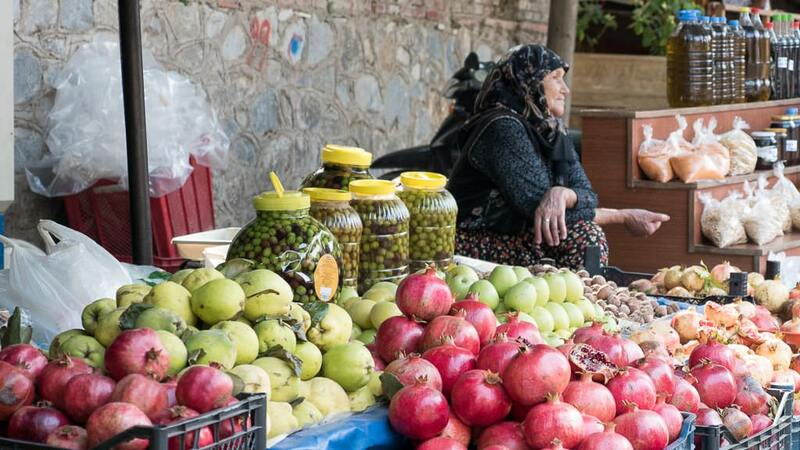 Here are a few of our favorite ways to spend a day on shore excursions from Kusadasi. Shuffling our feet along a street made from marble slabs, we were walking the Marble Road, which cuts through the heart of what was the second largest city in the Roman Empire, Ephesus. As we walked along, our guide pointed to grooves carved from the frequent traffic of chariots and carts, and to beautiful mosaic sidewalks alongside the road. Mark Antony and Cleopatra rode in procession here, our guide told us. St. John lived nearby. In the Grand Theater, St. Paul preached to the Ephesians. 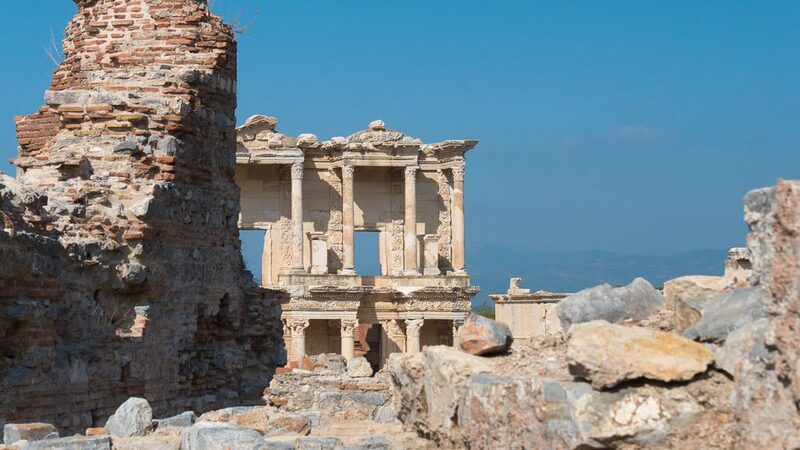 From its wonderful, mostly intact or rebuilt ruins, Ephesus echoes voices of the past and reveals centuries of history. 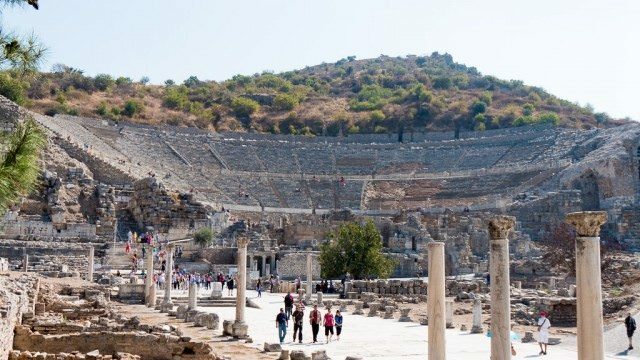 The classical Greeks established Ephesus more than 2,500 years ago, but the city began to flourish when it came under control of the Roman Republic around 129 A.D. Thus, most of what you see in Ephesus today is of Roman origin. Roman temples and shops once lined the Marble Road. In the 2nd century, the Romans build the Celsus Library, which boasted more than 12,000 papyrus scrolls in its heyday. Today, all that remains is a two-story facade, rebuilt in the 1970s. Ephesus is a must-see in any season. Bring along a hat and drinking water, and, if possible, join a small group on a private tour for a more enriching experience than you would have as part of a large group. And don’t stop once you’ve seen Ephesus. Only a short drive away, up a winding and scenic road, you’ll find an unassuming small stone structure tucked away among the trees. Here on Mount Pagus is the Virgin Mary’s House. Catholic pilgrims visit the house on the belief that Saint John brought the mother of Jesus here to live the last years of her life. Several popes have also paid visits to what is now a shrine. 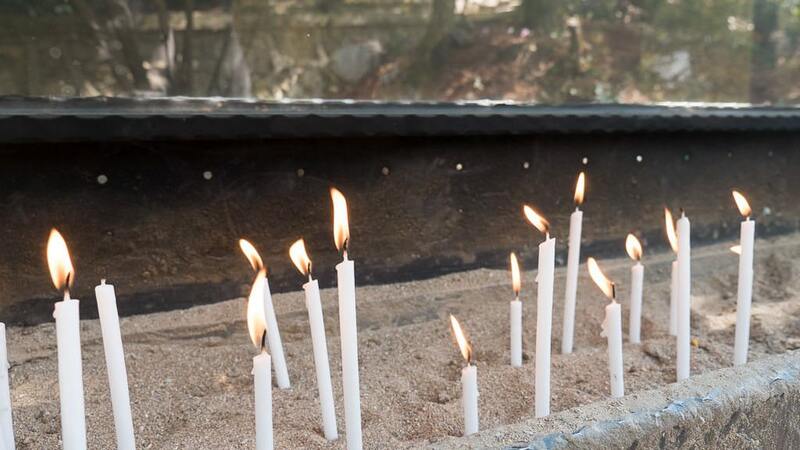 If you’re so inclined on your visit to this holy house, step outside to light a candle in memory of your loved ones or sip holy water dispensed from a fountain in a stone wall. The experience of visiting the Virgin Mary’s House is moving for many and a curiosity for others. I am glad I went the extra few miles to step inside the Virgin Mary’s house. From Ephesus, head to the town of Seljuk. 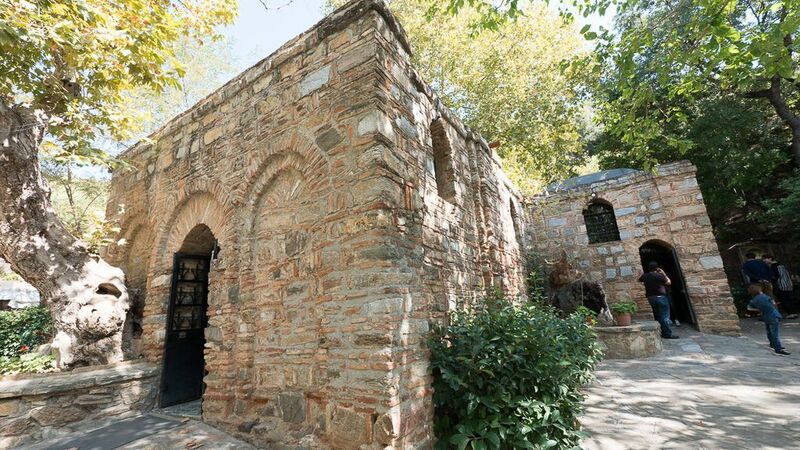 It’s only a short drive away but it comes with some significant sites: the ruins of the Basilica of St. John and the Temple of Artemis, both of which were part of Ephesus, and the Isa Bey Mosque. All are a stone’s throw from one another, and you could easily conduct a thorough visit of all three within a couple hours. The Apostle John, author of the Bible’s Book of Revelation, reportedly lived to the age of 100 and spent his final years at the basilica in Ephesus. His tomb was said to have been placed under the central dome in the Basilica. 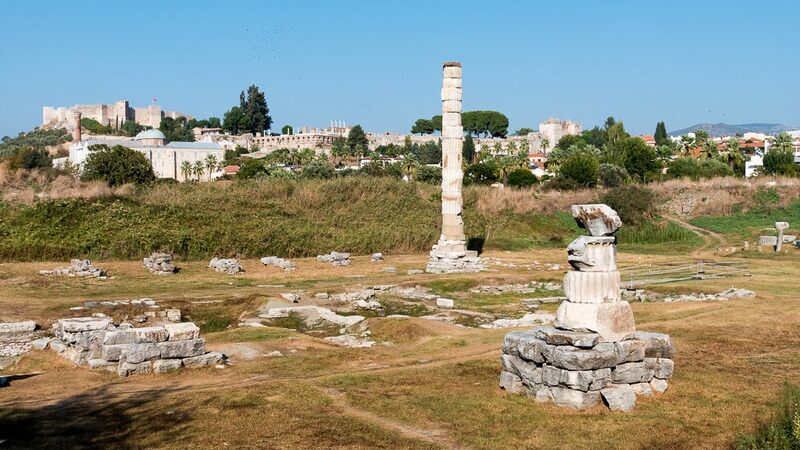 Nearby, and visible from the Basilica of St. John, is one of the Seven Wonders of the Ancient World, the Temple of Artemis. 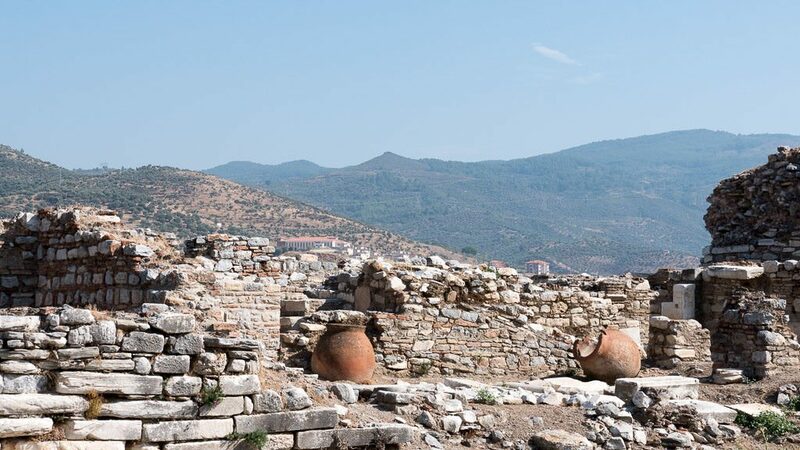 The once monumental structure was a sacred site connected to Ephesus. 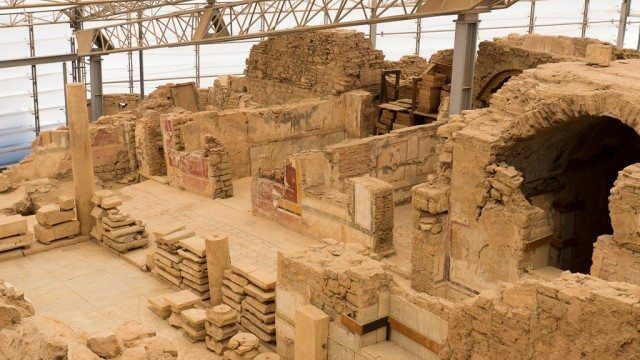 The Greek temple was completely rebuilt a few times before its final destruction, which probably came at the hands of the Goths, a Germanic tribe. Today, only a single column remains, constructed of dissociated fragments discovered on the site. 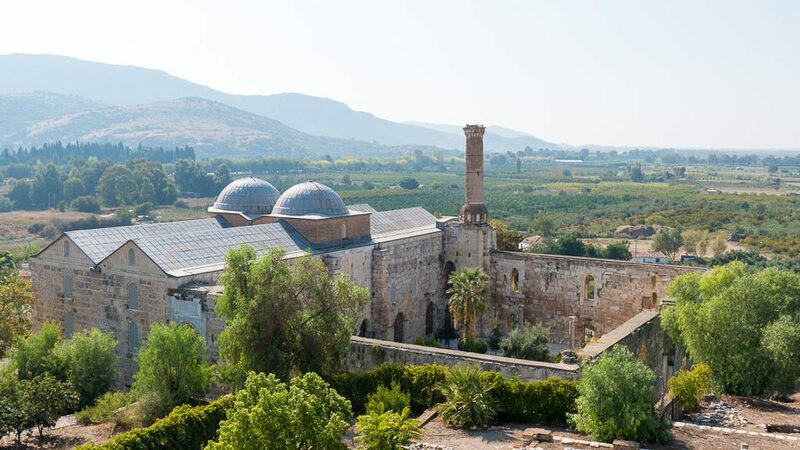 Situated between the Temple of Artemis and the Basilica of St. John, the Isa Bey Mosque was built in 1375. 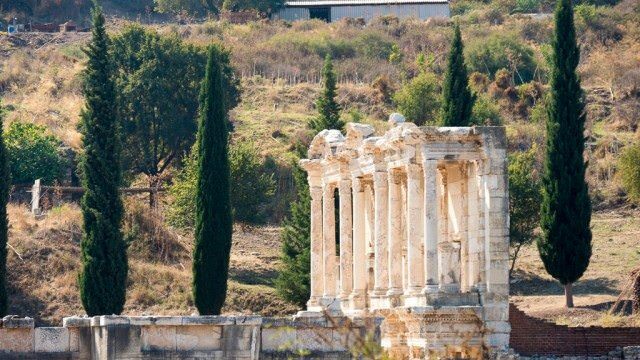 Much of the mosque was constructed from columns and stones found in the ruins of Ephesus and the nearby Temple of Artemis. Think of it as some of the earliest efforts to recycle building materials. During our visit to Ephesus, we were fortunate to step inside the 2nd-century Terrace Houses, which were opened to the public in 2006. 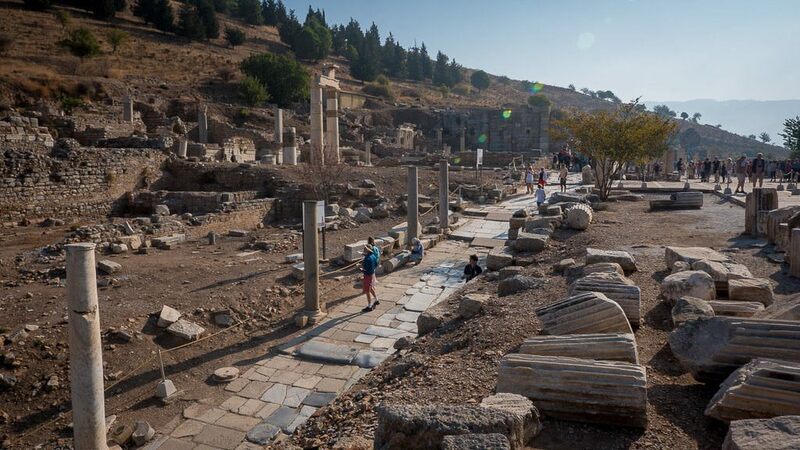 This is where the wealthy and important people of Ephesus lived. The Terrace Houses are still being excavated and restored, and you will likely see the process in action on your visit. Be sure to take notice of the many mosaics and frescoes that give impressions of the lifestyles of the well-to-do in ancient Ephesus. 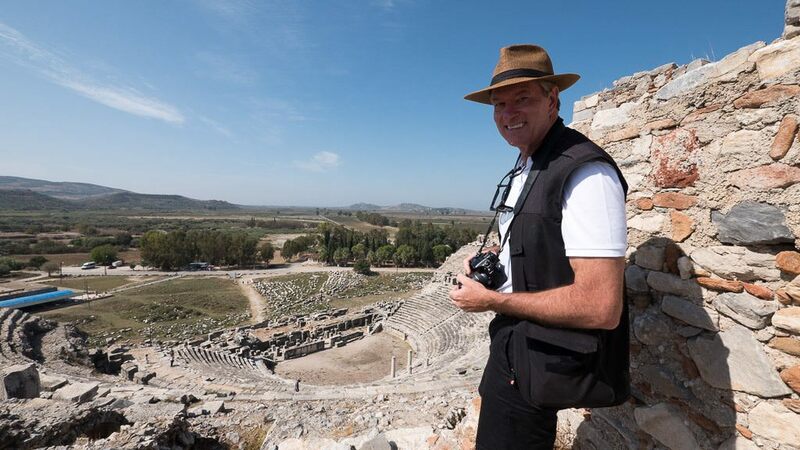 You may also want to attend an evening concert at one of the open-air venues on the grounds of Ephesus. 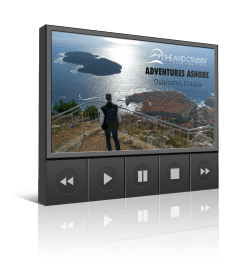 Many cruise lines offer the evening concert as shore excursions. Imagine sitting in front of the facade of the two-story Celsus Library, listening to classical music while enjoying complimentary beverages and snacks. For me, the evening concert an Ephesus was a moment that went down in my lifebook of memorable experiences. Try not to miss it if you have the opportunity. Ephesus and Miletus have a few things in common, the most interesting of which may be their demise. Though they contributed, invasions, earthquakes and fire did not destroy these great cities. It was water — or more accurately, the lack of it. Both were harbor cities, with access to the sea provided by rivers. Over the centuries, the rivers silted up, and both cities lost their access to the sea. Never underestimate the power of Mother Nature. Miletus was the oldest and the most powerful of the 12 Ionian cities in Asia Minor. The city was located on the coast, at the mouth of the River Meander. In fact, Miletus boasted four harbors, and its strategic location on the west coast of Asia Minor made it a major player in the commerce of the ancient world. But also because of the harbors and its location, Miletus was repeatedly captured by envious invaders. Miletus is said to be a city where geniuses were born. Indeed, one of the more significant claims attributed to Miletus is that it was the first city to which the principles of modern town planning were applied. The grid plan, introduced by Hippodamos, was later to form the basis of town planning in all Roman cities. You will see the ruins of the theatre, thermal baths and the stadium here, and the once-thriving harbor. Be sure to visit the Archaeological Museum at Miletus to see artifacts representing the many ancient sites of the area. 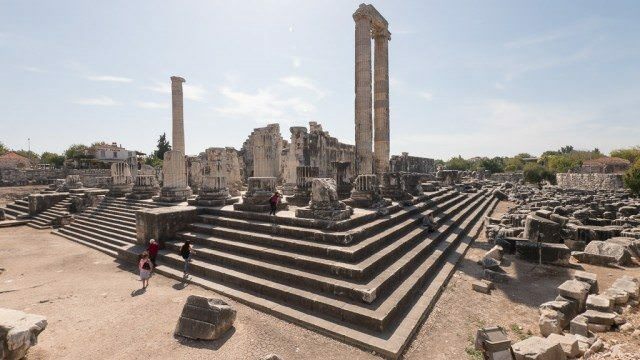 Also, while you’re in the area (Miletus is about a 75-minute drive from Kusadasi), you may as well travel another 15 minutes or so to visit the Temple of Apollo, an ancient Greek sanctuary in Didyma. The most renowned oracle of the Hellenic world outside of Delphi, the Temple of Apollo was once connected to Miletus via the Sacred Way, a pilgrimage road spanning about 17 kilometers. Whether it is true or not, I like the story about how Sirince got its name. The story goes that in the 15th century freed Greek slaves fled from Ephesus into nearby hills to hide from their Turkish captors. The clever Greeks named the village they founded “Ugly” (or Çirkince in Turkish) thinking that no one would want to come to such a place. In 1926, the governor of Turkey’s Izmir Province changed the name to Sirince (meaning “sweet” or “pleasant”) to reflect the true characteristic of the town. 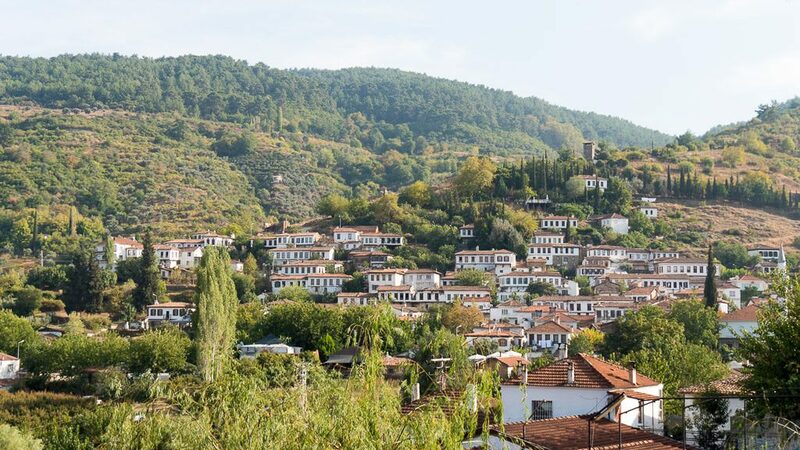 I found Sirince to be authentic and charming, with beautiful homes situated on the hillsides amid vineyards, olive trees and the like. We walked the hilly streets of Sirince, wandering through the markets and interacting with the friendly locals. We had come here to have lunch in a local home. Our guide told us that there are around 10 homes that are used for local lunches, and because the homes are small, groups are limited to no more than eight people. 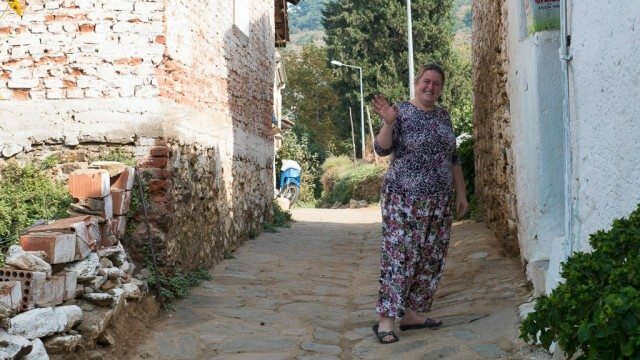 Our host greeted the three of us and motioned for us to walk up a cobblestoned street and into a small entryway where we removed our shoes and entered into the owner’s small home. It was absolutely charming. We had lunch in a small, upstairs room with beautiful views outside the open windows. Lunch was delicious, with fresh vegetables from the garden and dishes prepared with other locally produced products. 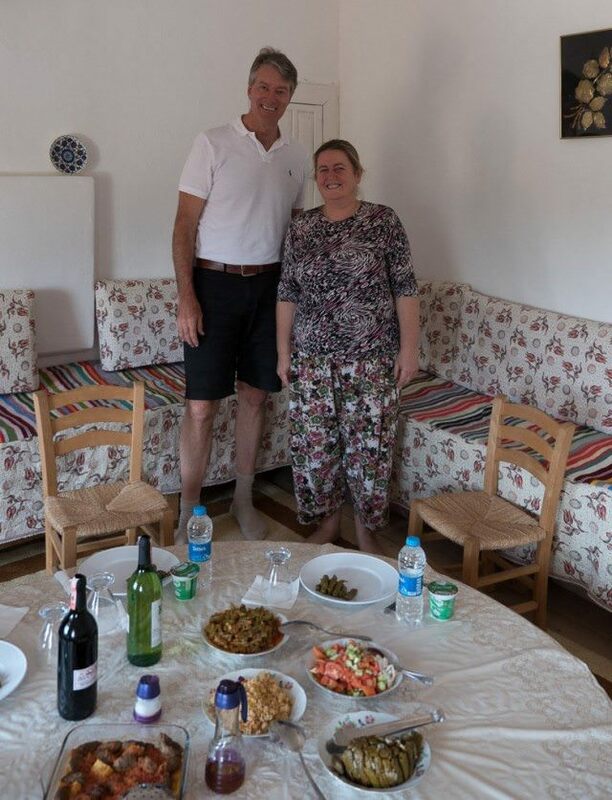 Of all that I experienced from Kusadasi, the lunch in the local home was certainly one of the highlights, and I highly recommend it for a memorable experience. Though our host did not speak English, our guide did, and he translated for us as we asked questions: What was it like to live here? She would not want to have been born anyplace else, she said. Where did the vegetables come from? My garden, she said, pointing out the window. Do you have children? Yes, a son and daughter. These are only a few of the shore experiences accessible from Kusadasi. 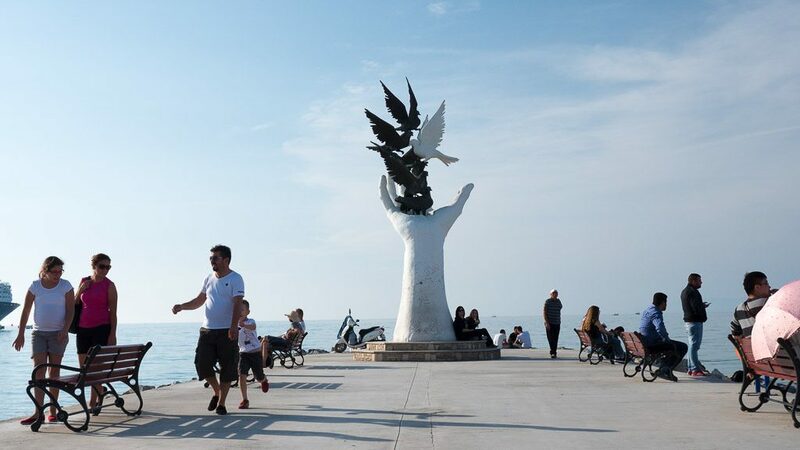 There’s also Kusadasi itself, where you can sit at an outdoor cafe, do some window browsing (or actual purchasing), or take a long stroll along the bustling waterfront beside the sea. Don’t miss the opportunity to make the most of your time when your ship calls in this fascinating Turkish port. And if you discover something I missed, I’d love to hear from you. Wonderful…one day I hope to be back to see how it has changed…..I lived in Istanbul in the early 50’s and went there as a young child…. I reread this after I have been there…..It is still wonderful….actually more wonderful…..The tree is still there that I climbed as a kid….at that time, there were no guards….no lines…..just my parents and me. So much more has been dug up since the 40’s and 50’s….It is an amazing spot….No one should miss it….but put your walking shoes on, because you will need them….The Terrace houses are amazing. Although we didn’t have lunch with a local family, we had lunch in a school for women…..the food was as I remembered it….delicious…..